Based on one the best selling books of all time, Gone With The Wind stands among the greatest epic dramas ever filmed. Vivien Leigh is Scarlett to Clark Gable's Rhett in cinema's greatest epic of passion and adventure. With its immortal cast, magnificent cinematography and sweeping score, this cherished classic continues to thrill audiences today. Batten down the hatches: it's time for me to confront Gone With the Wind, the ultimate "chick flick". Regular readers may know of my lack of affection for that genre, and no film comes with the baggage attached to this one. The movie is the most financially successful picture ever; in figures adjusted for inflation, Wind's US gross surpasses one billion dollars. It also has many adherents who think it's the best film ever made as well. The American Film Institute almost agrees, as Wind winds up sixth on their list of the 100 greatest movies. This makes it difficult to view the flick without many prejudgments. Actually, part of that job was already done for me, since I initially saw Wind more than a 20 years ago. I'd long resisted any urge to see the movie just because I couldn't imagine what pleasures it would hold for me, especially considering its extreme length. Almost four hours of melodramatic mush didn't sound too enticing. However, when I was in college, I had a friend named Tara (really!) who adored the film. (Yes, I believe her parents named her after the movie’s house.) When the film played one night at the student union, I had nothing better to do so I finally consented to take in a showing. To my surprise, I thought it was a pretty watchable movie. I can't say that it really boiled my potatoes, but it was much more entertaining and compelling than I'd expected. Sure, it went on too long, but it kept my interest for the most part. Years down the road, I finally decided to see it again via its DVD release. Despite the success of my initial screening, I can't say I was too excited about this prospect. I kept a lingering memory of my enjoyable viewing from back in the Eighties, but not enough specific reasons for that attitude to make the idea truly exciting. Once again, I found the film to be mildly pleasurable, though I can't say I fully appreciate its appeal. Wait - scratch that. I do think I know why this melodrama still wins so many hearts. It's pure soap opera from start to finish. We watch Scarlett O'Hara (Vivien Leigh) toy with her many suitors as she pines for her one true love, Ashley Wilkes (Leslie Howard). However, Ashley cares for another woman, sickly-sweet do-gooder Melanie Hamilton (Olivia de Havilland), so she jumps on other beaus in pathetic attempts to provoke his jealousy. Not until she hooks up with manly-man Rhett Butler (Clark Gable) does Scarlett meet her match, but even then, she remains unhappy and longs for Ashley's bland charms. All that and the Civil War, too! Clearly the audience for this flick is the same that goes after goopy tragedies, and I've never really understood their appeal. Maybe people just like to have a good cry now and then. Wind possesses more strengths than most of those, but it's still a melodrama at its heart, and a fairly shameless one at that. At the risk of sounding sexist, I can't help but think that many women love this movie because it shows a flirty young babe who suffers and eventually gets her comeuppance. Without spoiling the plot, Wind ends somewhat ambiguously, but it doesn't conclude particularly happily. Scarlett pays for her sins. Scarlett clearly has some positives, as she's a very determined and forceful woman who never gives up no matter how difficult the circumstances become. However, these are outweighed by the fact she's a whiny, nasty piece of work. She baldly uses men and even marries some suckers just to wheedle out them what she wants, whether money or status. She appears to possess absolutely no convictions whatsoever other than "Me, me, me" and she never displays any genuine regret for what she does. Sure, she's sorry by the end, but that seems more the result of her crummy situation than any sort of moral reckoning. Leigh does a very good job in the role, as she nicely portrays Scarlett's journey from coquettish Southern belle to down-on-her-luck survivor and back again, but she can't make the character likable. Granted, I don't think anyone could, since Scarlett is such a bad person. However, I always felt as though we were supposed to care for Scarlett and worry about what happened to her. Not a chance - if anyone says they actually rooted for her success, they're lying, as we all wanted to see her get her just desserts. Gable is strong as her opposite number. Rhett also seems like a jerk most of the time, but he's allowed a much greater degree of humanity than is Scarlett. Even when she has a daughter, Scarlett barely seems concerned with anything other than her own beauty, whereas Rhett fully gives his life over to his child. He also remains maddeningly in love with Scarlett, although she's too stupid to realize what a good thing she has. Gable portrays the different layers of the character adeptly and makes him more sympathetic than he probably should be. As our two main supporting characters, Howard and de Havilland become sunk by the one-dimensional nature of their roles. De Havilland at least fights her way to bring some complexity to Melanie, though not much can rise to the surface in such a unilaterally good and pure personality. Melanie exists to show a contrast with the mercenary Scarlett, but the part goes too far and seems extremely unrealistic. Howard is probably the worst thing about Wind, at least in regard to its main characters. For one, I never could figure out why this son of the South spoke with a British accent, but Gable doesn't exactly sound like he's from Kentucky either, so I'll leave that problem alone. Of greater concern is the utter lack of charisma he displays. This is a guy so hot that he has two babes vying for him, and dopey Scarlett hangs onto the dream of him until almost the bitter end. Why? He's not particularly handsome, he doesn't seem very bright or personable, and he has the charisma of a dirty sponge. Part of the problem comes from the writing, as the script could at least have offered some reasons for his appeal, but a lot of the confusion stems from Howard's exceedingly bland performance. His work creates a severe weakness in the film from which it never really recovers, at least when we look at the Ashley/Scarlett/Melanie triangle. Although these flaws should have been obvious at the time of the film's release, some others appear that seem evident mainly to changing attitudes. I was rather startled to see the degree to which Wind glorified the Old South, and it didn't just praise the mint juleps. We're led to see the plantation lifestyle of gentility and elegance as the ultimate in living, until those dirty, thieving northerners came along and ruined it all. I'm surprised the movie doesn't generate more attention for its backwards politics. Some condemn films like Birth of a Nation for their racism. You don't hear much of that talk about Wind even though it clearly espouses very anti-black and "status quo" viewpoints. The film presents the attitude that everyone was happy and all was well in the south under the slave system until emancipation ruined it all. While I'm sure the Civil War did strongly alter the normal course of events for rich white people in the south, I'm not of the opinion this was a bad thing. In fact, I think it's pretty good. Sure, troubles existed for a while due to the upheaval, but that's inevitable; progress doesn't always come smoothly and without commotion. Never does the tone of Wind indicate that the changes were anything other than negative, though, and I find that attitude distasteful to say the least. Obviously the portrayals of black characters aren't exactly positive either, though at least Mammy (Hattie McDaniel) musters some respect from her own strength. Many will be put off by the typical "yassum" and "massa" dialect of the black participants, but I won't strongly slam that, as it seems historically accurate. After all, it's not as if actual slaves in the 1860s spoke the Queen's English with perfect diction. The most unfortunate aspect of the portrayals stems from the fact these kinds of roles were all that was available for black actors of the day, but that doesn't make the work itself especially egregious, though Butterfly McQueen's shrieking really goes over the top. If you can get past the backward politics of Gone With the Wind, you'll find it to be a more enjoyable picture. Of course, if you could get past the fascism of the Nazis, I'm sure you'd have found Germany in the 1930s to be a pleasant place to live. Perhaps it's unfair of me to place the attitudes of Wind in that same category, but I must acknowledge that I disliked the reactionary position it presents. The attitudes don't ruin the movie, however, as they largely stay to the background. After all, Wind is mainly a sudsy melodrama about young people in love. The Civil War backdrop exists largely to give the plot a reason to make Scarlett sink to the depths of despair. I respect the art of Wind, as it's a solidly-made film that manages to remain fairly entertaining over nearly four hours, which is no mean feat. However, that doesn't mean I have to like it, and between the racial attitudes and the annoying characters, it becomes a less-than-scintillating experience. 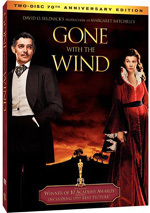 Gone With the Wind appears in an aspect ratio of 1.33:1 on these single-sided, double-layered DVDs; due to those dimensions, the image has not been enhanced for 16X9 televisions. Though not without some very minor issues, the visuals of Wind looked radically superior to anything we’d expect from the 70-year-old movie. Sharpness generally looked accurate and concise, with only a few scenes that showed some mild softness. Most of the film seemed quite precise and well-defined. A little lack of delineation occasionally interfered with a few shots, but not with any consistency. I noticed the slightest of moiré effects on a few occasions, but these were largely inconsequential, and I saw no signs of jagged edges. The print itself appeared miraculously clean for such an old movie. Light grain could be seen at times but that was it. The quality of the print would seem fine for a recent movie, but for an elderly flick to look so fresh and free of faults seemed amazing. For the most part, hues seemed bold and brilliant. The colors of Wind were frequently a serious treat for the eyes as they virtually leapt off the screen. The movie offered a broad palette and the film displayed these with stunning clarity and vividness. Black levels seemed terrifically deep and rich. Shadow detail looked clear and appropriately opaque. Gone With the Wind isn't the best-looking DVD I own, but it certainly looked fantastic, with or without consideration of its extremely advanced age. Not as strong but still relatively positive was the film's Dolby Digital 5.1 soundtrack. Gone With the Wind came from a mix that was originally monaural, and though the remixed version livened up the action a bit, the sound designers didn't try to reinvent the wheel. The 5.1 track remained largely stuck to the center channel, and significant portions of it didn't differ from the mono mix in the least. I was able to gauge that last fact because this DVD also included the original mono track, and I occasionally flipped between the two, although I listed to the 5.1 mix for the vast majority of the movie. It seemed as though only a few parts of the track strayed far beyond the center speaker. At times the score branched out to the sides, and a few of the showier action scenes - such as attacks on Atlanta - featured moderate effects that also move to the surrounds. However, for the most part, this remained a monaural track. 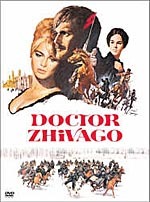 The ambition on the part of the sound designers was quite modest, and appropriately so, since an old film like this wouldn't hold up to intense remixing. Quality seemed similar for both, though the 5.1 track displayed greater depth at times. Again, a lot of it sounded identical, but it's clear that the 5.1 mix showed more range, especially during the scenes that departed from the center channel. The explosions benefited the most from the added range, as they even sparked the subwoofer mildly on a few occasions, but some portions of the score also seemed cleaner on the remix. Dialogue sounded clear and relatively natural on both tracks. Effects displayed some slight distortion during their louder moments but they generally seemed acceptably precise. Music featured the same moderately restricted range heard in the other components - and very typical of films from this era - but it came across as adequately smooth and listenable. Not for one second will you mistake the soundtrack of Gone With the Wind for one found on a more recent film, but it worked pretty well for the material and held up nicely under most scrutiny. So how did the picture and sound of this “70th Anniversary Edition” release compare to those of the 2004 DVD? Both versions appeared very similar. I’d be surprised to learn that any changes came from the audio, as I believe both offered identical tracks. As for the picture, apparently the flick got a new transfer for 2009, but I’d be hard-pressed to cite any differences. The 2004 edition already looked excellent, and the 2009 one was similarly terrific. The new disc may’ve been a smidgen stronger, but I’d find it tough to indicate any distinct improvements in terms of the 2009 DVD’s presentation. The “70th Anniversary Edition” loses most of the supplements from the 2004 Collector’s Edition package. Only one component carries over: we find an audio commentary from film historian Rudy Behlmer. A frequent contributor to DVDs of this sort, Behlmer also appeared on discs such as The Adventures of Robin Hood and Casablanca. Since Behlmer invariably provides useful, lively commentaries, I looked forward to his discussion of Wind. 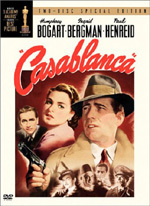 He starts with the score and how Max Steiner landed the gig and then goes through the opening credits, the history behind the tale, the creation of the book and changes from novel to screen, biographical notes about the main participants, a mix of controversies such as production difficulties, firing the original director and hiring a new one, and reshoots, sets and locations, production design and cinematic elements, cut sequences, the film’s reception, Margaret Mitchell’s lack of participation in the flick, and its legacy. Whew! That’s a packed agenda, and Behlmer handles it all well. Inevitably, some dead air occurs, but not much given the extreme length of the film. At times I think Behlmer concentrates a little too heavily on biographical sketches of the participants, as I’d prefer some additional notes about the movie’s creation itself. Nonetheless, this doesn’t cause any real problems, and Behlmer cranks through the subjects well. It’s yet another informative and entertaining discussion. Due to its status as a classic - perhaps even the classic - it's hard not to recommend Gone With the Wind, as I believe everyone should see it at least once. You can't consider yourself a literate film fan if you've never taken in this blockbuster. However, I think it's too flawed a movie to merit more than a screening or two. It's generally entertaining and moves well for a nearly four-hour program, but many of the characters are problematic and the attitudes dated and offensive. The DVD offers fantastic picture with solid audio and a very good audio commentary. If you don’t own the 2004 DVD of Wind, the “70th Anniversary Edition” may merit your attention, though fans who want lots of extras would be better off with the massive “Ultimate Collector’s Edition” or a copy of the four-disc Collector’s Edition from 2004. The former comes with a list price of nearly $70, so it’ll be pricey. The latter is out of print but you should be able to find a used copy for a reasonable price. If you don’t care about supplements and just want the movie, the two-disc 70th Anniversary release will be the way to go.